British Telecom (BT) telephone cards, named 'BT Phonecards' ever since their first release in July 1981 until May 1996 used Landis & Gyr optical card technology for use with all of their telephone cards. However, in mid 1996 BT switched the technology used from 'optical' to 'chip' technology. The decision to change technologies used had its origins in the early 1990s when BT formed a working group to investigate the feasibility and discontinuing optical in favour of chip cards, which many other countries / telecoms around the world were already using. The original rationale for changing to chip cards was two fold. Firstly, the optical system pattened by Landis & Gyr (L&G), was seen as dated technology (L&G had developed optical technology in the late 1970s), it was also seen to tie BT to one supplier and the associated risks involved, e.g. monopoly, production cost increases, etc. 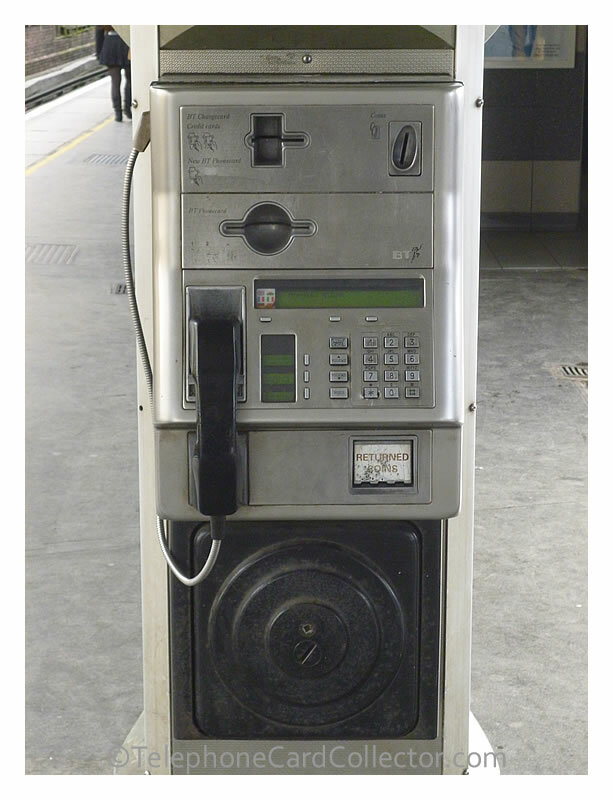 Secondly, it was proposed by BT that the new chip cards could also be used in other applications alongside making calls from BT Payphones e.g. paying for parking, vending machines, public transport, etc. However, despite various trials, none of these additional concepts were brought to market. The new BT Chip Cards were issued nationwide and sold to the general public through newsagents, Post Offices, etc from June 1996. The UK wide release followed various trails including the 'Alpha Trails' in East Grinstead in West Sussex where chip cards were issued to 6th form students from Imberhorne School to use in 20 specially adapted BT Payphone 2000 payphones. This trail ran from October 1994 through to January 1995. Another low scale 'Alpha Trial' took place in Liverpool from May 1995 through to August 1995 and from December 1995 to March 1996, here the Liverpool University Campus and the main shopping area of the city were used. Finally, a trail on a much larger scale was commissioned by BT, this was designated the 'Beta Trail' and took place in the Solent (Portsmouth and Isle of Wight) using BT Phonecards named Smartcards (as pictured right). Read more about the Smart BT Phonecard Solent Beta Trial. The new BT Chip Cards included chip modules from GPT, Gemplus, ODS and Schlumberger. Landis & Gyr chip modules whilst trailled never made it into the final chips used bt BT on their BT Phonecards. Unlike Landis & Gyr optical technology based BT Phonecards which never expired. The new BT Chip Cards all featured an expiry date on the reverse of the card. 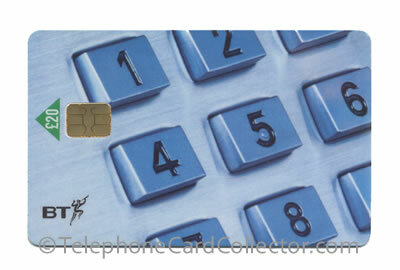 After the expiry date the telephone card could no longer be used to make calls from a BT payphone. Whilst many telephone card collectors embraced the new BT chip cards, some in fact sold off their optical BT collections in favour of collecting the new chip cards. The general consensus in 2019 is that optical BT Phonecards are collected more widely than their newer chip card counterpart. 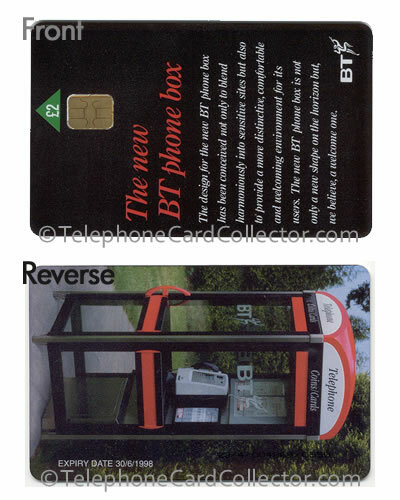 The BT chip cards pictured below all appear in the UK 2 World Phonecard Catalogue. 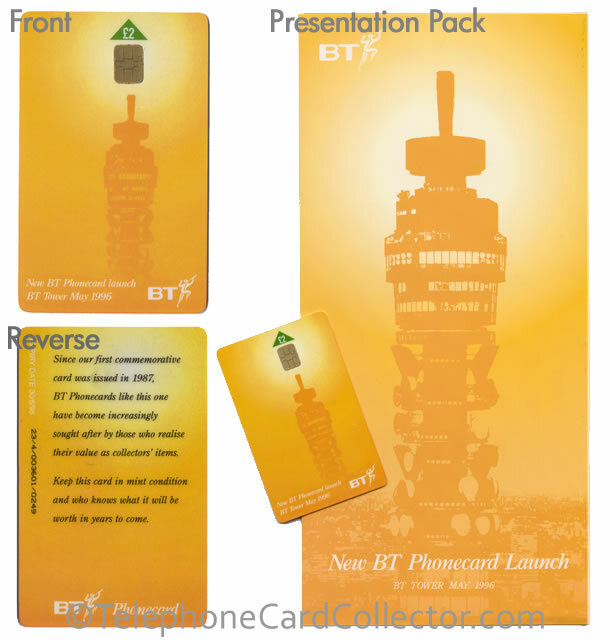 To view all of the BT chip cards simply purchase a copy of the UK 2 World Phonecard Catalogue. First national £2 issue chip telephone card. This card was issued with both GEM chip modules (as pictured above) and the smaller GPT2 chip module. 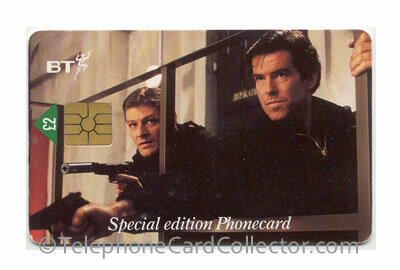 James Bond Goldeneye BT Phonecard, part of a six card public set. An additonal two cards were issued internally through BT and sold in special limted edition presentation collector packs. Major Customer Team BT Phonecard. 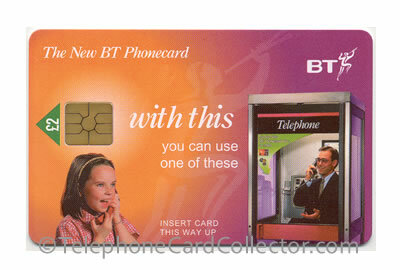 BT telephone card depicting the KX100 kiosk with new look. The front and reverse of the card are shown. 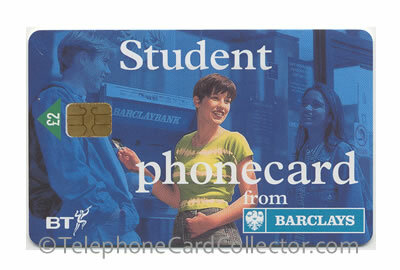 £10 Exeter University BT Phonecard. This card was reprinted as required and therefore was issued in three different batches all with varying expiry dates Expiry 06/98, Expiry 03/99 and Expiry 03/00. 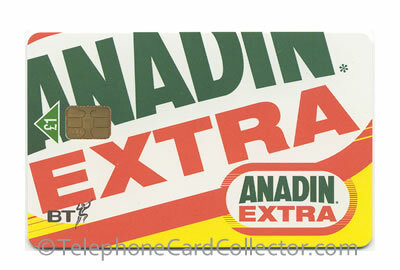 Medical Anadin Extra £1 BT Phonecard. 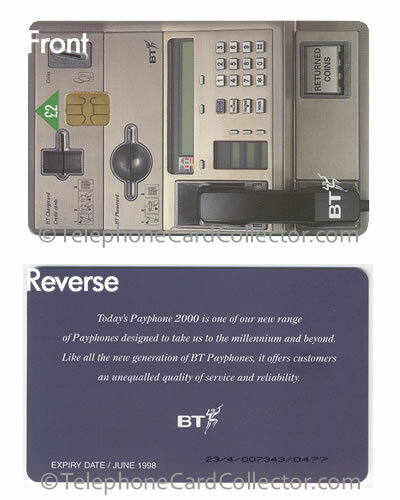 BT Phonecard depicting the Payphone 2000. The front and reverse of the card are shown. 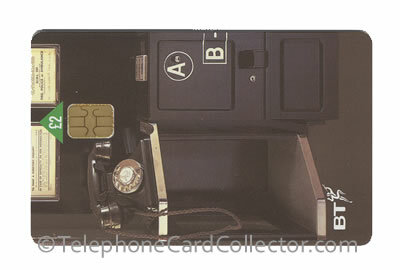 BT Phonecard depicting the Button A and B payphone. 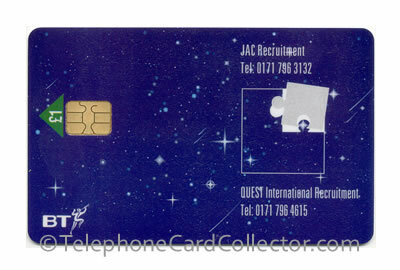 Dr Who chip BT Phonecard. This card was the final Dr Who BT Phonecard to be released in a 15 card set to depict scenes, doctors and characters from the BBC Dr Who TV series. 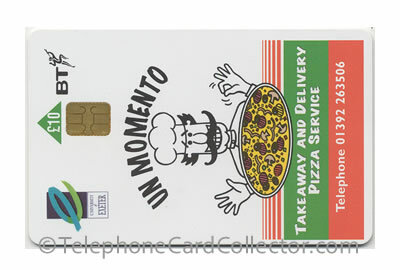 As well as being the final card, it is also the only card to use chip card technology, with a value of 50p. 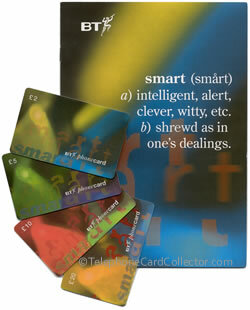 The previous 14 cards all used the earlier optical phonecard technology. 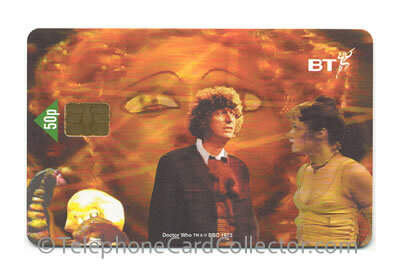 Read more about the complete BT Phonecard Dr Who set. 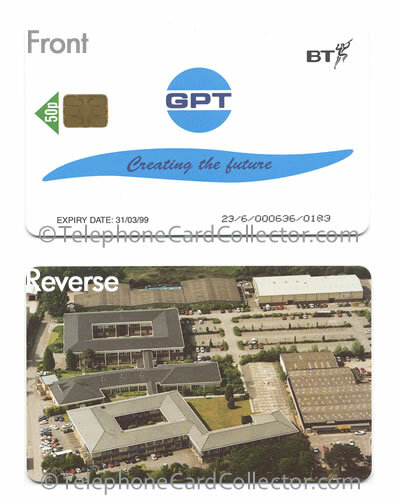 GPT: Creating the Future BT Phonecard. The front and reverse of the card are shown. 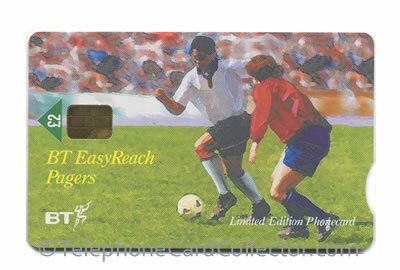 BT Easy Reach Pagers - £2 World Cup 1998 - England football team BT Phonecard. 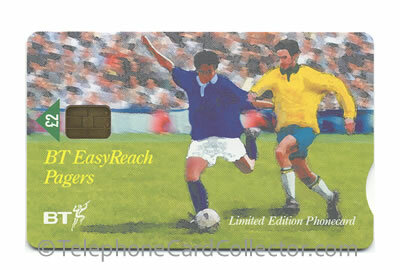 BT Easy Reach Pagers - £2 World Cup 1998 - Scotland football team BT Phonecard. 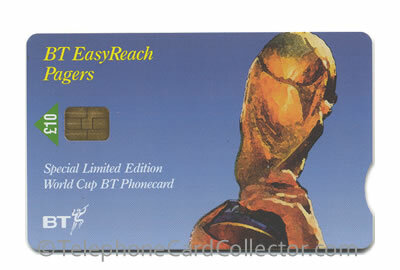 BT Easy Reach Pagers - £10 World Cup 1998 BT Phonecard. Please do NOT copy any content without prior consent, thank you.